The prevalence of detectable AR-V7 in CTCs, which was 9%-15% before treatment with enzalutamide or abiraterone, was increased to ~ 50% after progression on either agent. These results clearly indicate that AR-V7 detection in CTCs represents an important new predictive biomarker for response to enzalutamide and/or abiraterone, and that increased AR-V7 expression may represent one of the mechanisms of resistance to these agents. Figure 1: Schematic representation of AR-FL and AR-V7 structure. ( a ) AR transcripts. The solid and hatched boxes denote exons and cryptic exons, respectively. AR-FL: full-length androgen receptor; AR-V7: androgen receptor splice variant-7. ( b ) AR proteins. 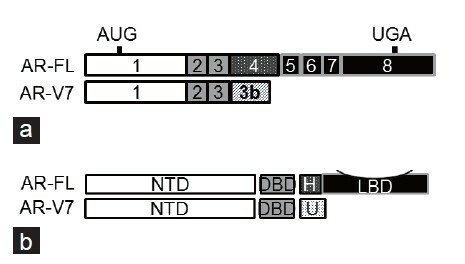 NTD: N-terminal domain; DBD: DNA-binding domain; H: hinge region; LBD: ligand-binding domain; U: unique C-terminal sequence. It is important to understand the methodology of the AR-V7 detection and the clinical cohort in order to understand the study by Antonarakis et al. First, note that this is not a tissue-based marker. The assays were performed on CTCs derived from the blood of men with advanced prostate cancer. This means that if there were no CTCs, those samples would not be evaluable for AR-V7 status. Second, the assay has some arbitrary cut-offs for sensitivity that may vary in the future. As a positive control, an AR-V7-expressing prostate cancer cell line (VCaP) was used to "spike" normal blood. Polyadenylated mRNA was isolated from the CTCs, and after reverse transcription (RT), polymerase chain reaction (PCR) with specific primers was performed to assess both AR-FL and AR-V7. Patients examined in these assays all had far advanced cancer, mCRPC, and many had undergone multiple therapies at the time the assays were performed. All patients with AR-V7 also expressed AR-FL. Unlike prior manuscripts where the AR-V mRNAs were expressed in very low quantity compared to the AR-FL in human tumors, , the AR-V7 was expressed in reasonable proportions to the AR-FL. In quantitative RT-PCR assays, the AR-V7 was expressed between 1.8% and 208% of the AR-FL transcript. Antonarakis ES, Lu C, Wang H, Luber B, Nakazawa M, et al. AR-V7 and resistance to enzalutamide and abiraterone in prostate cancer. N Engl J Med 2014; 371: 1028-38. Dehm SM, Schmidt LJ, Heemers HV, Vessella RL, Tindall DJ. Splicing of a novel androgen receptor exon generates a constitutively active androgen receptor that mediates prostate cancer therapy resistance. Cancer Res 2008; 68: 5469-77. Zhang H, Zhan Y, Liu X, Qi Y, Zhang G, et al. Splicing variants of androgen receptor in prostate cancer. Am J Clin Exp Urol 2013; 1: 18-24. Guo Z, Yang X, Sun F, Jiang R, Linn DE, et al. A novel androgen receptor splice variant is up-regulated during prostate cancer progression and promotes androgen depletion-resistant growth. Cancer Res 2009; 69: 2305-13. Hu R, Dunn TA, Wei S, Isharwal S, Veltri RW, et al. Ligand-independent androgen receptor variants derived from splicing of cryptic exons signify hormone-refractory prostate cancer. Cancer Res 2009; 69: 16-22. Sun S, Sprenger CC, Vessella RL, Haugk K, Soriano K, et al. Castration resistance in human prostate cancer is conferred by a frequently occurring androgen receptor splice variant. J Clin Invest 2010; 120: 2715-30. Watson PA, Chen YF, Balbas MD, Wongvipat J, Socci ND, et al. Constitutively active androgen receptor splice variants expressed in castration-resistant prostate cancer require full-length androgen receptor. Proc Natl Acad Sci U S A 2010; 107: 16759-65. Hörnberg E, Ylitalo EB, Crnalic S, Antti H, Stattin P, et al. Expression of androgen receptor splice variants in prostate cancer bone metastases is associated with castration-resistance and short survival. PLoS One 2011; 6: e19059. Hu R, Lu C, Mostaghel EA, Yegnasubramanian S, Gurel M, et al. Distinct transcriptional programs mediated by the ligand-dependent full-length androgen receptor and its splice variants in castration-resistant prostate cancer. Cancer Res 2012; 72: 3457-62. Lu J, Lonergan PE, Nacusi LP, Wang L, Schmidt LJ, et al. The cistrome and gene signature of androgen receptor splice variants in castration - Resistant prostate cancer cells. J Urol 2014. Sun Y, Wang BE, Leong KG, Yue P, Li L, et al. Androgen deprivation causes epithelial-mesenchymal transition in the prostate: implications for androgen-deprivation therapy. Cancer Res 2012; 72: 527-36. Bianchini D, Lorente D, Rodriguez-Vida A, Omlin A, Pezaro C, et al. Antitumour activity of enzalutamide (MDV3100) in patients with metastatic castration-resistant prostate cancer (CRPC) pre-treated with docetaxel and abiraterone. Eur J Cancer 2014; 50: 78-84. Loriot Y, Bianchini D, Ileana E, Sandhu S, Patrikidou A, et al. Antitumour activity of abiraterone acetate against metastatic castration - Resistant prostate cancer progressing after docetaxel and enzalutamide (MDV3100). Ann Oncol 2013; 24: 1807-12. Noonan KL, North S, Bitting RL, Armstrong AJ, Ellard SL, et al. Clinical activity of abiraterone acetate in patients with metastatic castration - Resistant prostate cancer progressing after enzalutamide. Ann Oncol 2013; 24: 1802-7. Schmid SC, Geith A, Böker A, Tauber R, Seitz AK, et al. Enzalutamide after docetaxel and abiraterone therapy in metastatic castration - Resistant prostate cancer. Adv Ther 2014; 31: 234-41.